''CHAMPIONS OF OUR TIME'' HITS THE CINEMAS . 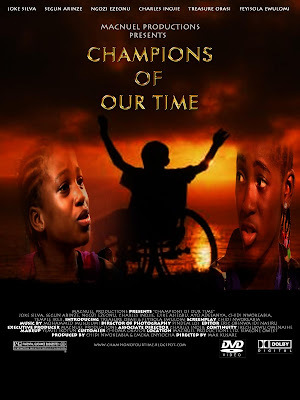 The multiple award winning movie ''CHAMPIONS OF OUR TIME'' which premiered on the 28th Nov,2010 at the SILVERBIRD CINEMAS. LAGOS is set for theatrical release on the 24th Decemeber, 2010 at SILVERBIRD CINEMAS LAGOS, ABUJA and PORT-HARCOURT. CEDDI PLAZA, ABUJA : 11.45AM, 4.10PM, 8.30PM. MULITIPLE-AWARD WINNING "CHAMPIONS OF OUR TIME" WILL BE PREMIERING AT THE SILVERBIRD CINEMAS, LAGOS ON NOVEMBER 28th, 2010. RED CARPET STARTS AT 4pm. IT WILL START SHOWING AT THE CINEMAS ACROSS NIGERIA FROM DECEMBER 3rd, 2010. Nollywood is abuzz and gearing-up to witness the Theatrical Premiere of MACNUEL PRODUCTIONS' latest effort, "CHAMPIONS OF OUR TIME", a motion-picture adaptation of an award-winning screenplay. This cinematic blockbuster feature promises to be perhaps the most critically-acclaimed film to come out of Nollywood in recent times. The screenplay was produced by the renowned Veteran Screenwriter, Chidi Nwokeabia, and seasoned Nollywood actor, Emeka Enyiocha, and was directed by the award-winning Mak 'Kusare -- one of Nigeria's most promising film-directors. This all-star cast movie assures the audience of a thrilling, entertaining as well as thought-provoking experience in quality film-making at its best, and is a testament of the Nollywood (renaissance) trend of a marriage between superior storytelling and the highest (technical) cinematic standards and capabilities obtainable -- a representation of a departure from the run-in-the-mill storytelling of yester-years. Its brilliant treatment of its topical subject matter is guaranteed to evoke empathy and reinforce the belief in the indomitable resilience of the human spirit. --CHAMPIONS OF OUR TIME has won the prestigious GOLDEN MBONI award at the just concluded LOLA KENYA SCREEN FESTIVAL, Kenya. --CHAMPIONS OF OUR TIME picked up the "Best Picture" and the "Best Actress" awards at the recently concluded ZUMA INTERNATIONAL FILM FESTIVAL. --Official Selection at DEEP FRIED INTERNATIONAL FILM FESTIVAL, U.K. FEATURING --- Segun Arinze, Joke Silva-Jacob, Ngozi Ezeonu, Ejike Asiegbu, Ayo Adesanya, Charles Inojie, (Introducing) Treasure Obasi and Feyisola Ewulomi, Paul Adams, Ejike Metu. This story revolves around two exceptionally brilliant young girls from opposing ends of the social spectrum. They both nurse ambitions of becoming the next winner of the prestigious St. Flairs Foundation Quiz Competition. However, their quest unravels a web of intrigue, high-stakes politiking, corruption in high places, and a culture of neglect and discrimination against the physically challenged amongst us. How far will the players go to achieve their dreams in the face of seemingly insurmountable odds? Find out in "CHAMPIONS OF OUR TIME".